The Great Plains bison is the largest terrestrial mammal in North America, and one of the largest wild cattle in the world. While the bison is no longer an endangered animal, the flavor profile of the original wild, range-fed bison is harder to find, as native grasses and fescues are replaced with cultivated commercial forage and some bison are being finished in feed lots and fed grains. Over the years, genetic integrity of the bison has also been compromised. 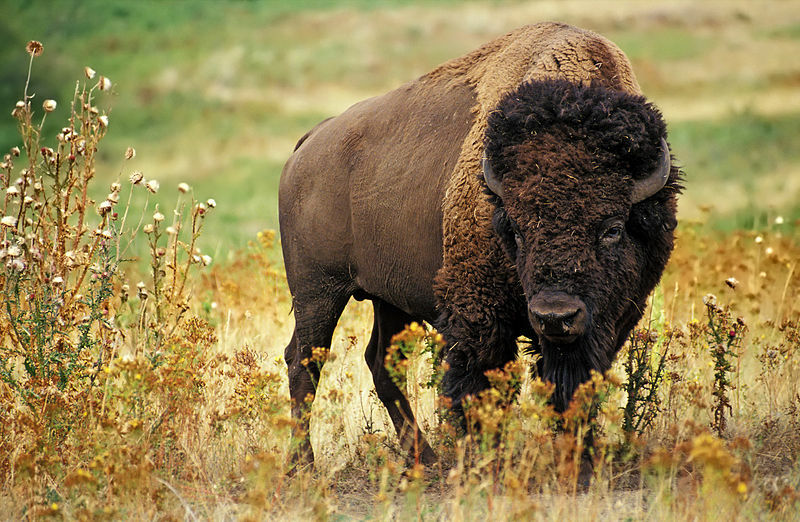 Inbreeding has led to leg problems, while some animals have been bred with cattle to produce sterile ‘cattalos.’ Bison have also been known to carry brucellosis and tuberculosis, particularly in the wild herds managed by the U.S. and Canadian governments. With the inclusion of the Great Plains Bison on the Ark of Taste, Slow Food Canada intends to highlight those producers who have gone to great lengths to raise these majestic animals in a way that most closely resembles the natural environment of the Wild Plains bison. Therefore, in promoting bison as a Slow Food Ark product we intend to ensure firstly genetic purity: breeding in the herd occurs naturally, without artificial insemination or embryo implant. The animal has not been crossed with domestic cattle. The animal is disease free and is not medicated; this includes the routine use of antibiotics and systemic wormers in a feed ration. Animals can be treated for disease with antibiotics but cannot be sold for consumption. Secondly, animals are grass-fed and grass-finished with access to native grasses. While occasional supplements of oats and forage hay, which does not contain genetically modified organisms are acceptable for inclusion on the Slow Food Ark, feeding of high protein grains such as barley and wheat, which can lead to liver damage would not be acceptable for an Ark product. The animals are not finished in feedlots or treated inhumanely. Finally, the traceability: that each animal is slaughtered and processed individually and that the meat from that animal is not ground or mixed with the meat of other animals. So it is possible, when the meat of a specific producer is served, for a consumer to know short production line. The history of East Central Alberta is closely linked to that of the North American Buffalo, or Bison. These great animals once roamed from Canada to Mexico, spanning the plains and the mountains. Their former numbers are commonly estimated at 60 million. Bison were the center of life for the Plains Tribes of Native Americans and the Métis, providing them with food, shelter, clothing and spiritual inspiration. Multiple factors led to the decimation of the massive buffalo herds that once roamed the Great Plains of North America. These factors included diseased animals brought on by stress; increased hunting by indigenous Plains inhabitants to supply the trade in buffalo hides, robes and tongues; and the elimination of buffalo herds by Canadian and American governments in order to starve the indigenous people and make their removal to the reserves easier.